In mountain caves secretly shine. eardgeard elfa, and esa bliss. tham the eftsithes eldo getwæfeth. Thus said Ælfwine the far-travelled: "There's many a thing in the West-regions unknown to men, marvels and strange beings, a land fair and lovely, the homeland of the Elves, and the bliss of the Gods. Little doth any man know what longing is his whom old age cutteth off from return." Now Tolkien had been working on The Lost Road in the year or so just before The Hobbit appeared (21 September 1937), and it's entirely reasonable to think that as he was casting about for some verses to inscribe in this presentation copy his mind came to rest upon the lines from The Lost Road. 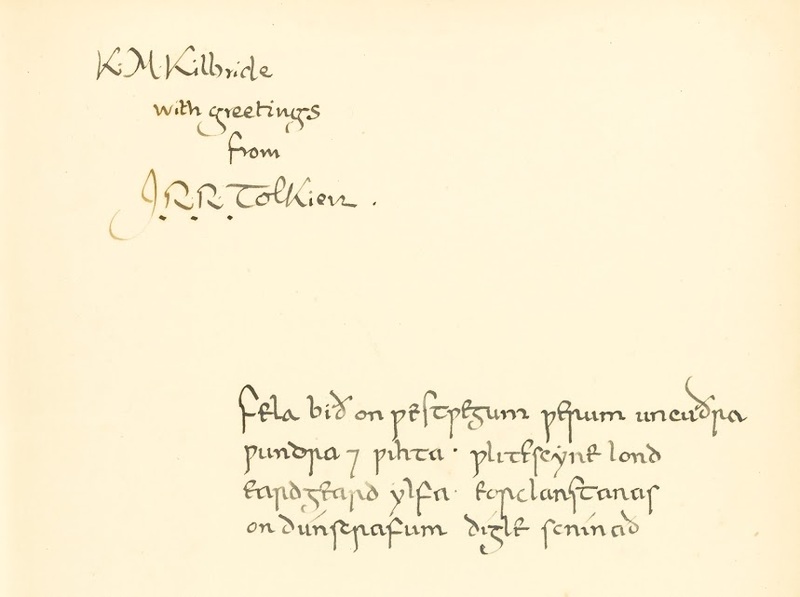 These verses, however, have a much darker tone, which Tolkien perhaps judged inappropriate for his former student, Katherine Kilbride, who was an invalid. So, he removed the grim bits and wrote new lines that he deemed more fitting for the occasion and for the nature of the gift he was giving. A 'variation', a 'divergence', would be Bilbo's 'eager feet' (FR 1.i.35) and Frodo's 'weary feet' (FR 1.iii.73) in The Road Goes Ever On. There a small change of the sort that Tolkien was so good at alters the tenor of the poem, and thereby the characterization of the speakers, suggesting something about their views of the roads they were about to set out upon. We may also say the same of the last version of the The Road Goes Ever On (RK 6.vi.987), which in a few new lines reveals yet another road and the speaker's attitude toward it. These changes are improving variations on a theme. Each is linked to the next, each reflects the story that is, and hints at the journey to come, just as the very first version of this poem, sung by Bilbo at the end of The Hobbit (313), relishes looking back down that road as part of the joy of returning home. He knows where he is going, and what he has escaped. But we have nothing like these variations, these evolutions, in the poems we are considering here. The verses in the Kilbride dedication and from The Lost Road differ from each other as much as Errantry and Bilbo's Song of Eärendil in Rivendell (FR 2.i.233-36). For all the similarities of word and rhyme and meter in Errantry and Eärendil, for all that both tell of a mariner who sets out on a journey to convey a message, the two are different poems. For the tale told in Errantry is silly and funny and the message slips the easily distracted mariner's mind, compelling him to start all over again, which is part of the humor of the poem. Eärendil, by contrast, is about the tragedy and triumph of a determined messenger who saves the world by delivering his message at great cost to himself. The same is true here. We have distinct poems that share part of a sentence. Let's look first at those shared lines, ignoring the orthographic variations. As so often in Tolkien, going all the way back to the early poems Goblin Feet and You and Me and the Cottage of Lost Play (The Book of Lost Tales 1.27-32) there is the image of a road and a journey. Westwegum, literally 'westways,' places the end of this road in eardgeard ylfa, the shining homeland of the elves: Elvenhome. This suggests not only the West beyond the sea in Middle-earth, but also -- and this is especially true for those unacquainted with Tolkien's legendarium in 1937, which is to say, for almost everyone -- conjures the other mythic western lands of the great sea, from the Isles of the Blessed to Tír na nÓg, from Atlantis to the unknown destination of Scyld's funeral ship (Beowulf 26-52). We can also likely detect a connection to England itself in this word, since, as Tolkien would have known, vestr-vegir, the cognate phrase in Old Icelandic, referred to the British Isles themselves; and of course Tolkien once meant to make England itself the homeland of the Elves (BoLT 1.22-27). In The Lost Road the wonder and splendor to be revealed in the West reaches yet higher. Not only will we men find Elvenhome, but we will glimpse esa bliss, the bliss of the gods. Though not for long, it seems. Esa bliss slips quickly away, beyond our grasp. We are left only with longing and old age. The wonder and beauty of the first lines turn dark because we cannot attain such bliss. It is not for us. Even the sight of it awakens a longing we can neither turn from nor satisfy. The divide between us and them could not be more clear. These lines, moreover, are 'laden with the sadness of Mortal Men,' as Legolas puts it after hearing Aragorn recite a poem of the Rohirrim in their own language (TT 4.vi.508). As such they touch upon themes of 'Death and the desire for deathlessness' which Tolkien later said lay at the heart of The Lord of the Rings.3 Not only does The Lost Road employ these lines with immediate personal relevance to the characters speaking and hearing them, a son and his aged, failing father, but it affords them a wider application. 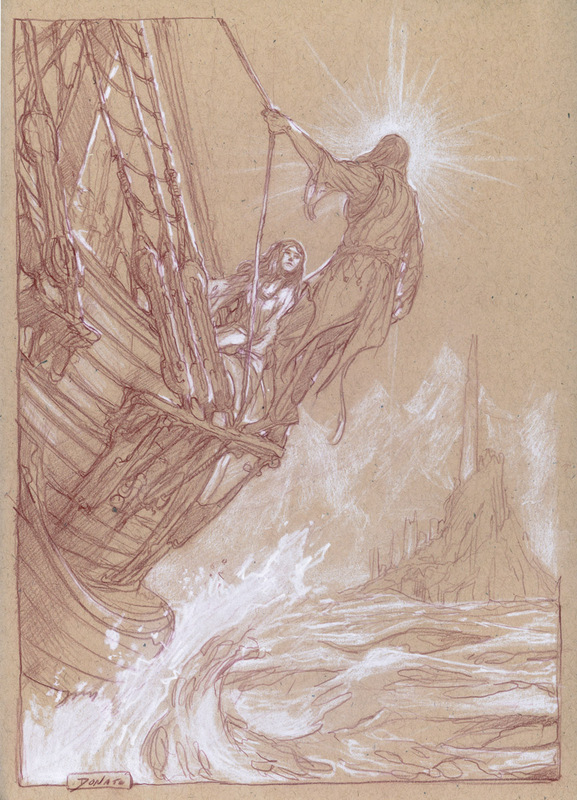 For with this work begins the Tale of Númenor, the island where men reject the fate of death and try to seize immortality and the 'bliss of the gods' by force, with cataclysmic results. Tolkien continued to develop this story for decades (as was his wont), in The Lord of the Rings, in The Notion Club Papers, in Akallabêth, and finally in Athrabeth Finrod Ah Andreth, which depicts men as already embittered about their 'swift fate' before the First Age had ended.4 The verses in The Lost Road may be said to contain within them the seeds, and perhaps the summary, of these themes. In the end, every man knows the longing for the bliss of the gods from which old age and death cut him off. And in Tolkien's The Legend of Sigurd and Gudrún, which he was also working in the 1930s, there exists for Sigurd, though dead, the promise of bliss after death and the world's ending. This mention of bliss here is interesting because even the possibility of it seemed to be denied to men in The Lost Road verses, and the defeat of old age and its sequel appeared quite final. As above, it is not so difficult to see what Sigurd has to do with Christ: bliss beyond the ending of this world in a new heaven and a new earth. Others words, too, in the Kilbride dedication provide a link to Christ and his ancient enemy, the dragon. For the words 'on dunscrafum digle' allude to the bestiary poem The Panther* in the collection Physiologus. So clearly points of contact exist between these texts, which help Tolkien to create the more hopeful tenor of the Kilbride dedication. For even if the reader of The Hobbit soon learns that the arkenstone glittering in secret beneath the mountain halls is guarded by a dragon, heroes, whether Sigurd or Christ, can also shine like a jewel in the darkness and defeat that venomous, ancient enemy (33-34: þām āttorsceaþan, his fyrngeflitan). And given his faith and his words on the wonders of far off Elvenhome, it is rather tempting to think that in the words geond middangeard Tolkien saw the meaning 'beyond Middle-earth.' However that may be, the allusive links are not to be doubted, even if in 1937 only C.S. Lewis and perhaps a few others could have felt their full import. In an hour unlooked for by Men this doom befell, on the nine and thirtieth day since the passing of the fleets. Then suddenly fire burst from the Meneltarma, and there came a mighty wind and a tumult of the earth, and the sky reeled, and the hills slid, and Númenor went down into the sea, with all its children and its wives and its maidens and its ladies proud; and all its gardens and its halls and its towers, its tombs and its riches, and its jewels and its webs and its things painted and carven, and its lore: they vanished for ever. And last of all the mounting wave, green and cold and plumed with foam, climbing over the land, took to its bosom Tar-Míriel the Queen, fairer than silver or ivory or pearls. Too late she strove to ascend the steep ways of the Meneltarma to the holy place; for the waters overtook her, and her cry was lost in the roaring of the wind. *Before anything else I would like to express my thanks to Dr Eleanor Parker for her gracious conversation and correspondence on the verses discussed above. It was she who brought The Panther to my attention. Any errors of translation or interpretation are entirely my own. 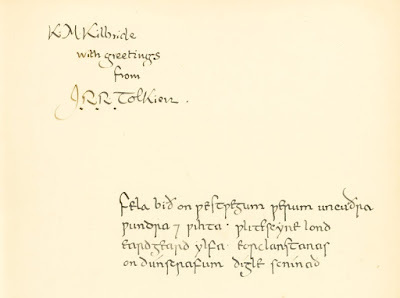 1The initial error in the Sotheby's catalog is doubly wrong, first as to the language of the dedicatory lines, and second in seeming to name John Rateliff as the source of that attribution: 'Rateliff identifies the Elvish verse as an extract from Tolkien's The Lost Road.' But in Rateliff's The History of the Hobbit (second edition, 2011) appendix v, which Sotheby's cites, Rateliff makes no mention of the language in which the verse is written. It is possible that Sotheby's did not intend the sentence to be read that way. 2 On Fairy-stories has appeared in print and on the internet so many times that referring to a page number in any one edition is almost unfair. I shall follow the practice adopted by Verlyn Flieger and Douglas A. Anderson in their Tolkien on Fairy-stories (2014), where they number the paragraphs. The quotation in the text above is from paragraph number 24. 3 See letter 203 (Letters 1981): 'But I should say, if asked, the tale is not really about Power and Dominion: that only sets the wheels going; it is about Death and the desire for deathlessness. Which is hardly more than to say it is a tale written by a Man!' And also 211: 'It is mainly concerned with Death, and Immortality; and the "escapes": serial longevity, and hoarding memory.' These letters date from 1957 and 1958, respectively. 'Then are you content here?' said Finrod. 'What mean you by that?' said Finrod. 5 I find it impossible not to think of Aslan while reading of the panther, but it seems equally impossible that no one has never noted that before. [George Du Maurier's novel] Peter Ibbetson is a story of the inner life, of the reality of dreams, and of the power of the mind to transcend observable reality. A boy and a girl growing up in France, "Gogo" Pasquier and "Mimsey" Seraskier, are separated as children and meet years later in England, by which time their adult lives are established. He has become Peter Ibbetson and she the Duchess of Towers. She is now married to a faithless and abusive husband, and Peter is the adopted dependent of his equally unsavory uncle, the wicked Colonel Ibbetson. They meet only briefly before being parted again, this time for life, when Peter is committed to a lunatic asylum for the unpremeditated murder of Colonel Ibbetson. Cumbersome and arbitrary though it is, this plot device is necessary for Du Maurier's purpose, which is to separate the lovers in daily life so that they may meet in an share one another's dreams. Their dream life then becomes their primary mode of being, and their waking hours a secondary, merely interim existence. In their shared dreams the lovers travel together back to childhood, revisit their old life and old haunts and, themselves unseen, observe the children they once were. Here Du Maurier moves explicitly into the realm of parapsychology, presenting the past and the present as intermingled or, perhaps more psychically, presenting them as a unified concept occupying the same dream space, differentiated only by limited observation and experience. The adult dreamers come to recognize that their present, dreaming selves were present in their own past, sensed by their childhood selves, who speak of being "haunted" by ghosts they cannot see, and which, of course, to ordinary perception do not even exist yet. Having taken the step from observable reality with the lovers to interior reality with the dreamers, Du Maurier makes and even greater leap from parapsychology to race memory. Taking ever-greater risks with probability, he sends his dreaming lovers beyond their personal past and memory into their ancestral past and family memory and history and finally back as far as they can go, back through race memory into a nineteenth-century dream of prehistory. Together they transcend the Paris suburb of their childhood to visit France in the ancien regime, to go back to the time of Napoleon, to Versailles and the Revolution and the taking of the Bastille, to the Renaisance of Villon, to the time of Charlemagne, and still on and back they go dreaming out into the ancient starlight, into a victorian vision of prehistory when only the earliest humans were awake, back to the Ice Age, the time of the mammoth and the cave bear. This dream-life goes on for many years, during which time, though their real-world selves age, their dream-selves remain youthful and vigorous. The lovers' apotheosis comes when the Duchess, whose death precedes Peter's, returns after death in dream to reassure Peter of her continuing, though now unmanifest, presence in his life. She tells him what she knows of the life beyond death, her realization that "sound and light are one" ... that "Time is nothing" ... and "time and space mean just the same as 'nothing'." A dark child and a fair. And mine was tangled fair? Were singing in the trees. When first there glimmered into sightThe Cottage of Lost Play. And with them You and Me. And we were one of these. We know not, You and I. We know not, You and Me. I would like to return to the question of the correspondences between these two texts, but only after I have read Peter Ibbetson. For now the poem and Flieger's description of the novel will have to suffice.